Burgundy velvet and lace Victorian era cape. This cape is perfect for Victorian or Gibson era costumes such as Charles Dickens, “A Christmas Carol”, or Victorian Christmas carolers. 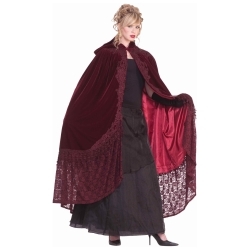 Cape is 56” long and made of velvet with lace trim.